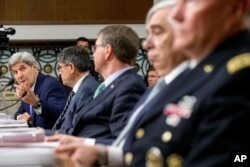 From left, Secretary of State John Kerry, Treasury Secretary Jacob Lew and Defense Secretary Ashton Carter testify before the Senate Armed Services Committee about the Iran nuclear deal on Capitol Hill, July 29, 2015. U.S. lawmakers pressed top administration officials Wednesday for details on the international inspection regime that will enforce a landmark nuclear pact with Iran. The officials, including Secretary of State John Kerry, Defense Secretary Ash Carter, Energy Secretary Ernest Moniz and the Chairman of the Joint Chiefs of Staff Gen. Martin Dempsey, testified before the Senate Armed Forces Committee to try to allay lawmakers’ concerns and convince them to approve the deal reached earlier this month in Vienna. In a testy exchange consistent with Capitol Hill’s generally frosty reception of the deal, the chairman of the Senate Armed Services Committee, Republican John McCain, vented frustration over Congress’ inability to review agreements between Tehran and the International Atomic Energy Agency. 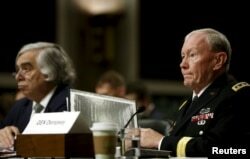 Chairman of the Joint Chiefs of Staff U.S. Army General Martin Dempsey, right, along with Energy Secretary Ernest Moniz, left, appear before the Senate Armed Services Committee in Washington, July 29, 2015. 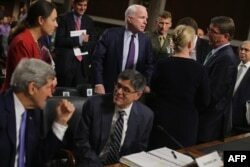 McCain was quick to interject. “To be honest with you, that is absolutely astounding that you have not seen the documents about the requirement for verification,” McCain said. “What’s critical to all of us, Mr. Secretary [Moniz], is that we have verification of and inspections of Iranian activities, because they have a clear record of cheating ... we should see those instruments of verification,” he said. Moments later, Kerry addressed the topic, saying there is no side deal or secret agreements between Iran and the International Atomic Energy Agency. There are only technical documents that are standard practice and not released publicly. "We are aware of what the basics of it are," Kerry told the committee members. "It is standard procedure for 189 counties that have an agreement with the IAEA. ... We don't get that. It is not shared with the world, but we do get briefed on it." Under the July 14 pact, world powers agreed to lift sanctions on Iran in return for curbs on a nuclear program the West suspects was aimed at creating an atomic bomb, but which Tehran says is peaceful. Congress has 60-day period to review the Iran nuclear agreement, and committees in both the House and Senate have been questioning senior members of President Barack Obama's Cabinet, particularly Kerry and Moniz, who were part of the team that secured the deal earlier this month. Wednesday’s hearing is the third in a week. Senators of both parties also pressed the officials on Iran’s financial windfall from sanctions relief stemming from the nuclear pact, and its desire and ability to use new revenue to buy weapons. McCain criticized the Iranian nuclear deal, saying it gives Tehran billions of dollars for a “shopping spree” on the international arms market. McCain, a leading critic of the deal and the Obama administration, listed the timetable for Iran in purchasing weapons and arms: at year five, Iran will be free to acquire fighter aircraft, attack helicopters and warships; at year eight, it will be able to acquire material for more sophisticated ballistic missiles. 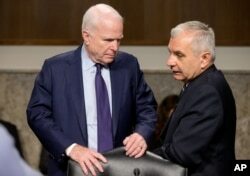 Senate Armed Service Committee Chairman John McCain, R-Ariz., left, talks with committee's ranking member Jack Reed, D-R.I., on Capitol Hill in Washington, July 29, 2015. Treasury Secretary Lew noted that some of Iran’s frozen assets are held by banks around the world, and would likely be released at a future date even if Congress rejects the nuclear pact. “This money is not sitting in U.S. banks. We can’t lock it up directly,” Lew said. “We have worked bilaterally with countries around the world to do things against their own economic interests because they agreed with us on the imperative of stopping Iran from getting a nuclear weapon,” Lew added. “If they see us walking away from an agreement ... I think the degree of cooperation we get goes down considerably," he added. Days after tough questioning by lawmakers on the Senate Foreign Relations Committee, Kerry sharpened his response to criticism that the deal's provisions were temporary and would not prevent Iran from obtaining a nuclear weapon in the long run. 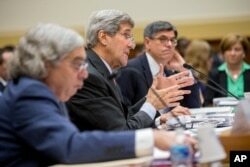 Secretary of State John Kerry, center, flanked by Treasury Secretary Jacob Lew, right, and Energy Secretary Ernest Moniz, testifies on Capitol Hill in Washington, Tuesday, July 28, 2015. "Iran has agreed to refrain from producing or acquiring highly enriched uranium and weapons-grade plutonium for nuclear weapons forever," he told the House of Representatives Foreign Affairs Committee Tuesday. ​"When it comes to verification and monitoring, there is absolutely no sunset in this agreement. Not in 10 years, not in 15 years, not in 20 years, not in 25 years - no sunset ever,” he said. Wednesday's committee focused on how the nuclear deal affects "U.S. interests and the military balance in the Middle East." Defense Secretary Ash Carter and Dempsey, the top U.S. military officers, tried to blunt criticism of the plan and reassure lawmakers that U.S. forces would check Iran's "malign" influence in the Middle East should Congress green-light the nuclear deal with Tehran. Carter, who toured the Middle East last week, defended the agreement, saying it is only one part of the U.S. strategy and that America is moving “full speed ahead” to confront Iran and the Islamic State group's malign activities in the region. He told lawmakers that while the deal removes "a critical element of risk and uncertainty" in the region, U.S. forces will remain vigilant in maintaining Middle East stability and defending Israel, degrading and defeating the self-described Islamic State extremist group, and serving as a bulwark against Iranian hegemony. "We will continue to maintain a strong military posture to deter aggression," Carter said. "We're continuing full speed ahead, standing with our friends, standing up to ISIL, and standing against Iran's malign activity," he added, using an alternative acronym for the Islamic State group. From left, Secretary of State John Kerry, Treasury Secretary Jacob Lew, Defense Secretary Ash Carter, Energy Secretary Ernest Moniz and Joint Chiefs Chairman Gen. Martin Dempsey testify on Capitol Hill in Washington, July 29, 2015. Many Republicans and some skeptical Democrats have voiced concerns that the historic accord reached with the Islamic republic by six world powers, including the United States, would trigger a regional nuclear arms race, embolden and strengthen Iran, and put key U.S. ally Israel in jeopardy. Dempsey said Wednesday that the recently signed nuclear deal works to keep Iran from having an atomic weapon, but does not address other concerns about Tehran's malign activities in the region. “These run the gamut from ballistic missile technology to weapons trafficking, to the use of surrogates and proxies to naval mines and undersea activity -- and last but not least, to malicious activity in cyberspace,'' Dempsey told lawmakers. “Ultimately, time and Iranian behavior will determine if the nuclear agreement is effective and sustainable,” he said, adding that he will continue to provide Obama with military options and will advise against reducing U.S. military force presence in the Middle East. The United Nations Security Council approved the terms of the deal last week, setting off a timetable that could see sanctions lifted by the end of the year. Activists deliver more than 400,000 petition signatures to Capitol Hill in support of the Iran nuclear deal in Washington, July 29, 2015. Congressman Ed Royce, the Republican chairman of the foreign affairs panel, said Tuesday it is "backwards and wrong" that the U.N. voted on the pact before the U.S. Congress completes its review. Royce also voiced skepticism about the agreement itself. "We appreciate President Obama's effort to secure the most intrusive inspections in history," Royce said. "But it came up short." The lead Democrat on the committee, Congressman Eliot Engel, said there are "a number of issues" he finds "troublesome" about the deal. "Fifteen years from now Iran will be essentially off the hook" for compliance with the agreement, Engel said, a contention Kerry rejected. Congress has until Sept. 17 to endorse or reject it. 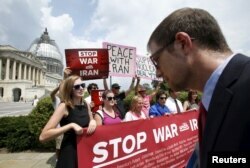 Rejection would prevent Obama from waiving most U.S.-imposed sanctions on Iran, a key component of the deal. Obama has vowed to veto any congressional rejection measure, meaning both the House and Senate would need to muster two-thirds majorities to override the president and refuse to lift congressionally imposed sanctions. Those sanctions, along with ones put in place by the United Nations and EU, came in response to allegations that Iran was using its nuclear technology to pursue nuclear weapons.